A university city, Aix-en-Provence allows everyone to become a student again, inspiring creativity, sparking curiosity, and encouraging you to step outside of what you know to be true. Often considered the “brainiest” city in France, Aix-en-Provence is the perfect place to go study. Even without ever stepping into a classroom, you’ll know you’re in good company, especially as you stop to examine how the light plays with shape and texture – whether on your lunch plate or on the pages of your sketch pad. One of the most well-known post-impressionists, Paul Cézanne who was both a draftsman and painter was born in the French Aix-en-Provence in 1839. Cézanne is credited for being the forefather of twentieth-century modernism. Although it wasn’t until the end of his life that his artwork really began earning a reputation for greatness, Cézanne is today considered a true master, so well-known that even the non-artsy recognize his name. Cézanne passed away in Aix-en-Provence in 1906, after having returned to the region in 1888 after his father’s passing. 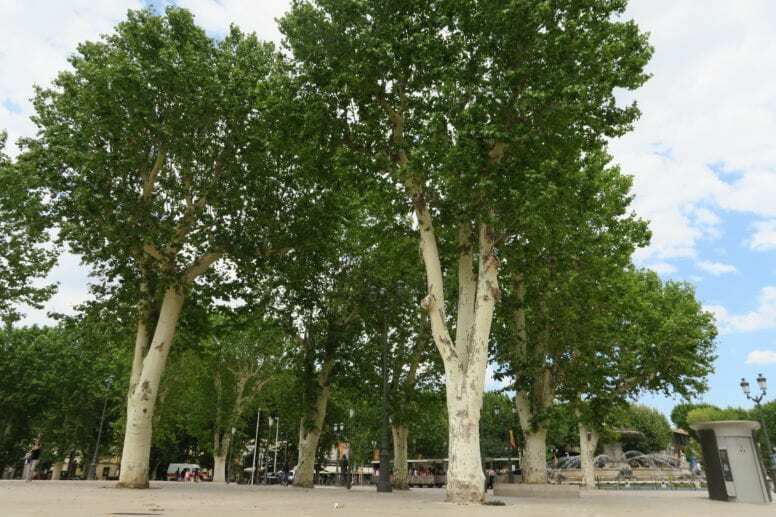 To visit the beautiful city of Aix-en-Provence is to steep yourself in the same environment that one of the greatest artists of all time found inspiration. 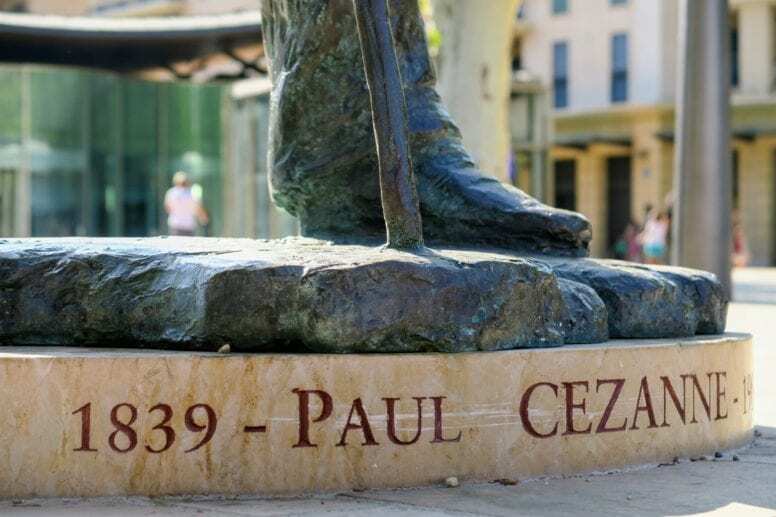 While there are no wrong places to go in Aix-en-Provence, there are definitely some you don’t want to miss, especially if you are curious to follow Cézanne’s – and other artists’ – footsteps. 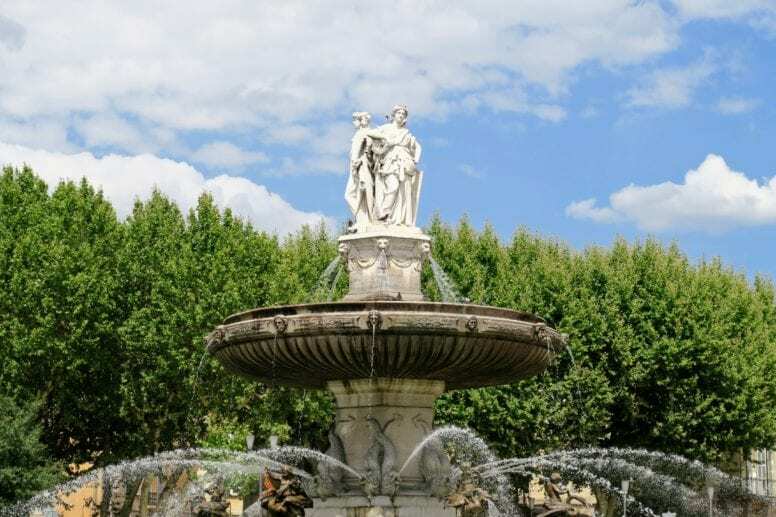 So, if you’re planning a holiday in the South of France soon, here is our list of the best things to do in Aix-en-Provence. Nestled in the country hillside of Aix, the artist’s studio is small, but miraculously still intact. Visiting the studio, you get a glimpse into how and where the “father of modern art” worked nearly every day for the last four years of his life. Beautifully cared for, the studio is set up to help visitors paint their own picture about the artist’s private life. In fact, only after his death was anyone allowed to enter the studio; the location acted as a sort of refuge from his day-to-day life in his apartment on Rue Boulegon. When in the studio, you’ll notice the unique light of the region, a better understanding of how the artist played with light to the point of near abstraction. In this studio, dozens of Cézanne’s most celebrated pieces of art were created, including the prized Large Bathers. A beautifully tree-lined street in Aix, Cours Mirabeau is the perfect place to literally walk in Cézanne’s footsteps. Paul Cézanne’s parents, Louis-Auguste and Anne-Elisabeth, worked on Cours Mirabeau in a former hat shop. Regardless of the weather, strolling down the wide thoroughfare helps you imagine what it looked like to Cézanne – and what he would make of it today. Regularly referred to as the “grandest boulevard” in old Aix, this destination manages to keep its down-to-earth vibe, making it easy to spend hours (if not a whole day) strolling, window-shopping, and people watching. 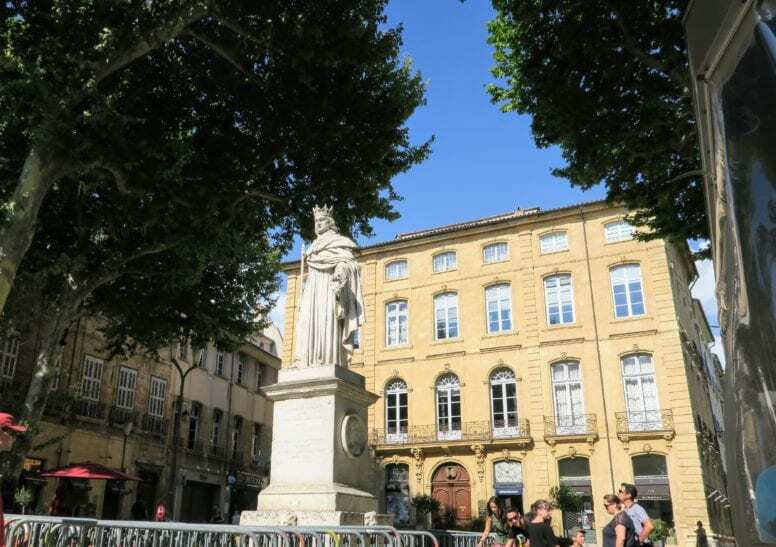 One of the busiest streets in Aix, there’s no shortage of things to do on Cours Mirabeau. A stunning Roman Catholic church in Aix, the Paroisse Cathédrale Saint Sauveur Aix-en-Provence (as it’s officially listed) is an incredible example of Romanesque and Gothic architecture. A French national monument, the church is built on the site of the first-century Roman forum of Aix. Each detail of the church provides artistic inspiration, from the bell tower and Roman columns to the four walnut doors on the facade. Taking time to enjoy the architecture of Paroisse Cathedral is to start to understand how an artist like Cézanne understood his world. The Planque Collection within the Musee Granet includes some beautiful tutelary pieces of Cézanne’s work, along with other artists like Philippe Meyer and Bourguignon de Fabregoules. During your visit, you can see a Rembrandt self-portrait as well as Jean-Dominique Ingres’s famous “Jupiter and Thetis”. The museum, which was built just one year before Cézanne was born, was completely restored in 2006 to honor Cézanne’s 100th birthday. Although a small museum, its history, as well as its collections, make it a must-see for art and culture lovers from around the world. Founded in 1966, the Fondation Vasarely is on a mission to bring “art for all” through a futuristic “city of tomorrow”. The building, which was officially opened a decade after the founding, consists of Vasarely’s own work: seven cells, hexagonal rooms, and 42 other large works of art. A unique artist, Vasarely builds on the foundation laid by artists like Cézanne to reimagine the way we see the world. Like nothing you’ve ever seen before, Fondation Vasarely can be a bit difficult to find, so be sure to ask a local or plan ahead so that your travel to the site goes smoothly. Aix-en-Provence most iconic fountain, the Fontaine de la Rotonde is often considered the unofficial center of the region. The Place de la Rotonde (where the fountain is located) took a decade to build, from 1840 to 1850, which means construction began when Cézanne was just one-year-old. The large fountain was added in 1860, featuring the design of Théophile de Tournadre. Measuring 32 meters wide by 12 meters high, the Fontaine de la Rotonde is adorned with twelve bronze sculptures, including lions, sirens, and angels. The three sculptures of women found on top represent Justice, Agriculture and, of course, the Fine Arts. Three different artists created the sculptures, adding to the collaborative nature of the work. Hôtel de Caumont is one of the most characteristic buildings in Aix-en-Provence. 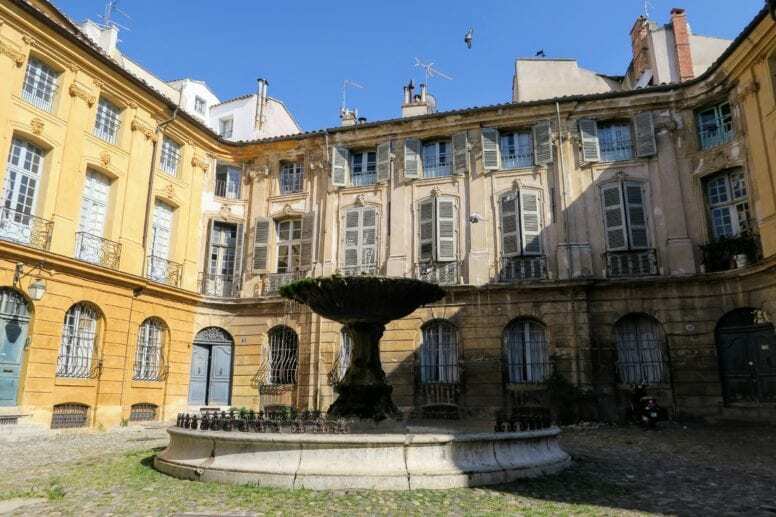 Dating back to 1742 this hotel is an important part of the French architectural and cultural heritage and a must-see on our list of things to do in Aix-en-Provence. These days, Hotel de Caumont serves as an art center and as a museum with interesting exhibitions. But apart from admiring the paintings of artists such as Marc Chagall or Paul Cézanne make sure to explore the property itself as well. In fact, it features an indoor fountain and a beautiful garden that will take you back straight to the classic and elegant 18th century. There is also a lovely cafè where you can take a break from sightseeing Aix and enjoy a typical Provencal dish. Camps Des Milles is an important cultural and historical place in Aix-en-Provence which used to be a concentration camp during the II World War. It hosts a museum where you can learn about the crimes of the Holocaust, its victims, and their stories. You can take a guided tour of an entire building where you’ll learn about the daily lives of the people there and see what was their life like on the camp. There is also a permanent exhibition regarding the Jewish children deported to Auschwitz and a painting gallery with murals painted by interned artists. Visiting Camp Des Milles is a touching and enriching experience that comes highly recommended on our list of things to do in Aix-en-Provence. It’s a valuable history lesson and also a way to pay tribute to those who lost their lives in the terrible genocide. No far from Aix-en-Provence lies Chateau La Coste – a beautiful place perfect for a unique day in Provence. Chateau La Coste is basically a biodynamic vineyard which was named as one of the “Top 100 Destinations to Visit in the World”. The history of this location starts in 2004 when Paddy McKillen – an Irish art collector decides to transform the Chateau La Coste winery into a center for contemporary art. Since 2011, the visitors from all over the world have a chance to admire incredible art pieces situated right in the middle of the grape plantation. The site also features a luxury hotel named Villa La Coste where you can enjoy high-quality accommodation in a unique scenery. Those of you who want to stop for lunch or for dinner can choose between four fantastic restaurants where you’ll be served the delicious Provencal cuisine. If you want to bring a special souvenir from Chateau La Coste, make sure to visit the lovely bookshop which features mainly the titles related to the local art, wines, and gastronomy. If you’re craving art and works of creativity, Aix-en-Provence is one of the best places you can visit not only in France but in the whole world. In fact, anywhere you look there seems to be a museum, a gallery or other inspiring site that will fill you with some healthy creative energy. 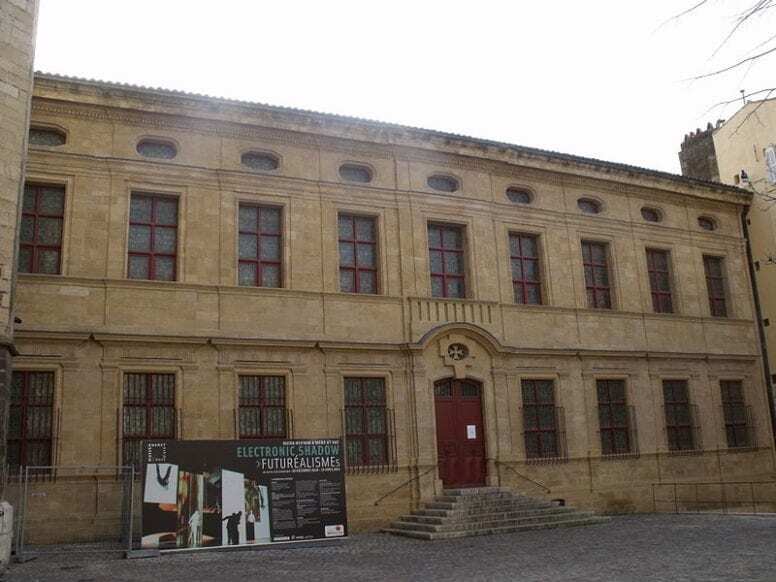 One of the top places to see in Aix-en-Provence for all of the insatiable art lovers out there is the Pavillon Vendome Museum. This 17th-century structure is considered the national heritage site in France and hosts interesting art collections and exhibitions. The garden outside is absolutely stunning and well-maintained. You can stroll around or even stop for a picnic and it’s actually free of charge. There is also a lovely pond in the middle of the garden and if you visit in the spring you’ll get to see all the beautiful and colorful flowers as well. Opening Hours: Daily except for Tuesday from 10.00 am to 12:30 pm and from 1:30 pm to 5.00 pm. From April 15 to October 15 it closes at 6.00 pm. 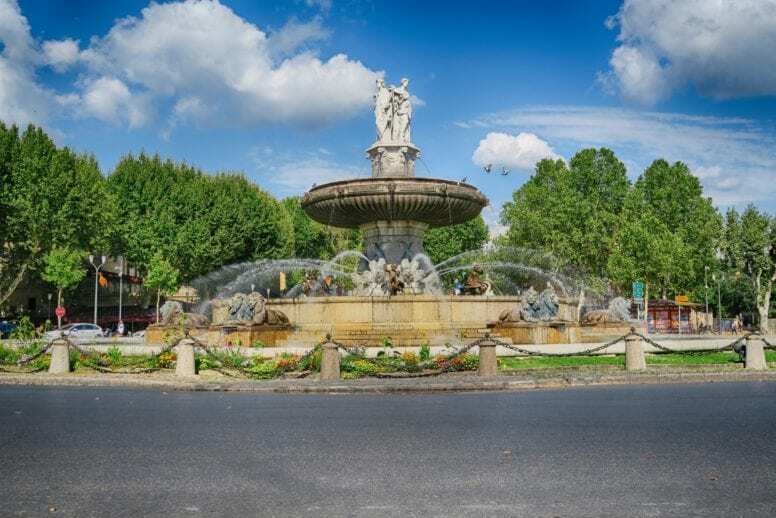 Located on the famous Cours Mirabeau is the Fontaine du Roi René – a 19th-century fountain named in honor of the King René of Anjou who died in Aix-en-Provence. In fact his marble statue designed by Pierre Revoil and sculpted by David d’Angers is a prominent part of the fountain. The whole structure, with a total weight of 6.6 tons, was made in Paris and it took about a month to transport it to Aix-en-Provence. Behind the Fontaine du Roi René you can see the beautiful Hôtel du Poët in baroque style from 1730. If you’re craving spending time in nature and in the midst of an incredible scenery then head to Bimont Lake. Located only a short trip away from Aix-en-Provence it is a truly charming place where you can escape the crowds and admire stunning views. You’ll be welcomed by the sky-blue lake and by an amazing combination of mountains, water and forest. You’ll also get to see the impressive Bimont Dam that was built in 1951 by Joseph Rigaud. The area around Bimont Lake is ideal for taking long strolls and hikes so remember to wear comfy shoes in order to make the most of it. 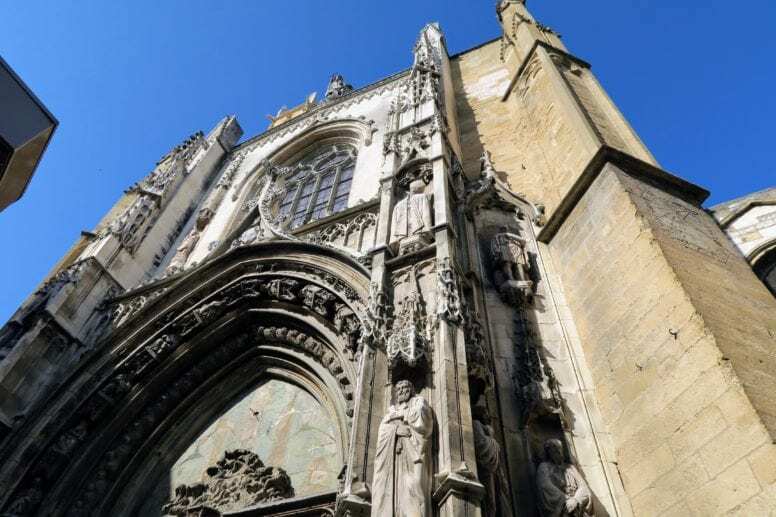 Another interesting museum to put on our list of the best things to do in Aix-en-Provence is certainly Musée du Vieil-Aix. There is no better place to learn more about the city’s history than this. This 17th-century building that served as a townhouse in the past was transformed into a museum in 1932. The collections are focused around the history and traditions of the city and you’ll get to see a selection of interesting objects such as furniture or pottery. There is also a wonderful display of puppets available and some paintings too. When visiting this museum make sure to look up and check out the ceiling as well since it features some extraordinary paintings. Although rather small in size Musée du Vieil-Aix offers many interesting things to see and gives you an opportunity to gain more knowledge about Aix-en-Provence. 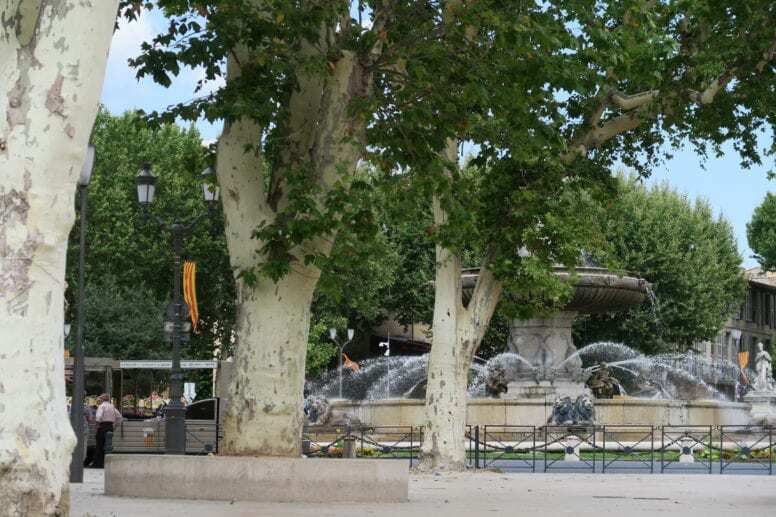 Place de l’Hôtel de Ville is a picturesque square located in the heart of Aix-en-Provence and a must-see on our travel itinerary. This charming location is home to important monuments such as the Town-Hall (Hotel de Ville), the Corn Exchange Hall and the Clock Tower. Right in the middle of the square, there is a beautiful 18th-century fountain designed by Jean-Pancrace Chastel who also sculpted the top of the Corn Exchange we mentioned before. When you visit Place de l’Hôtel de Ville you should soak in its typical Provencal atmosphere, snap as many pictures as possible and then relax in the square’s cafè while sipping a glass of wine and people watching. Three mornings a week, usually on Tuesday, Thursday and Saturday the square becomes an open-air flower market and fills up with scents, colors and people of course. A short trip away from Aix-en-Provence lies a charming medieval village of Puyricard. If you have some spare time during your holiday we highly recommend adding this location to your travel itinerary. If you’re into castles, palaces and country houses that have been around for centuries then you’re going to love this place. In fact, Puyricard is home to some beautiful “châteaux” such as the 19th century La Brillanne castle, the ruins of the 17th century Château de la Calade and also the Château du Grand-Saint-Jean. Another interesting spot to see in Puyricard is the 11th century church in roman style. When you visit La Brillanne you can also spend some time in its beautiful park, get some shade under the big trees and relax by the pond. Travel tip: Aix lies in the Provence-Alpes-Côte d’Azur region, which means that there are many beautiful French Riviera towns located nearby. You can visit the medieval city of Saint-Paul de Vence, discover the famous Pope city Avignon, relax on the sandy beaches in Saint-Tropez and dine in the charming Port Grimaud. You can also take a nice day trip to the Porquerolles Island, also known as the French Maldives. If you’re looking for a luxury accommodation right in the heart of the old town in Aix-en-Provence you should check out the Luxury Design Hotel Particulier le 28. This hotel is located very near many important attractions with Cours Mirabeau and Aix-Marseille III University Paul Cezanne situated only a short walk away. This prestigious building that used to be a townhouse dates back to the 17th century and offers a perfect combination of comfort, elegance and privacy to its guests. If you stay in this hotel you’ll be constantly surrounded by beautiful art pieces, paintings and sculptures. Luxury Design Hotel Particulier le 28 features fantastic rooms and suites, ideal for a relaxing holiday in the Provence. There is also a wonderful garden, a bar, a restaurant and a lovely Spa for all the guests to use. Villa La Coste is located in Chateau La Coste – a stunning biodynamic vineyard we mentioned in our list of things to do in Aix-en-Provence. If you want to stay in the middle of nature and wake up every morning to incredible views you should definitely consider this hotel. Villa La Coste features a lovely swimming pool and an elegant Spa with spa and with a wide choice of relaxing treatments. You can take advantage of one of the dining venues available on-site or take a quick trip to Aix-en-Provence and have dinner in the city centre. The rooms come in luxury and modern style with and some of the options include a private pool as well. Another interesting hotel you should take into consideration when planning a holiday in this charming town is the Renaissance Aix-en-Provence Hotel. Located very near the city centre this hotel offers modern and well-equipped rooms, an indoor pool and an on-site restaurant. Some of the rooms located on the top floor come with a stunning panoramic view of Aix-en-Provence. If you’re planning to do lots of sightseeing, the Renaissance Hotel comes highly recommended because it is conveniently situated near many top points of interest. Hôtel du Globe is a 3-star hotel situated in the old town of Aix-en-Provence that comes with a wonderful rooftop terrace. On the terrace, you can enjoy a refreshing drink, read a book or simply lie in the sun and recharge on Vitamin D.
The rooms are simple but clean and well-equipped and come with a TV, air-conditioning and free Wi-Fi as well. 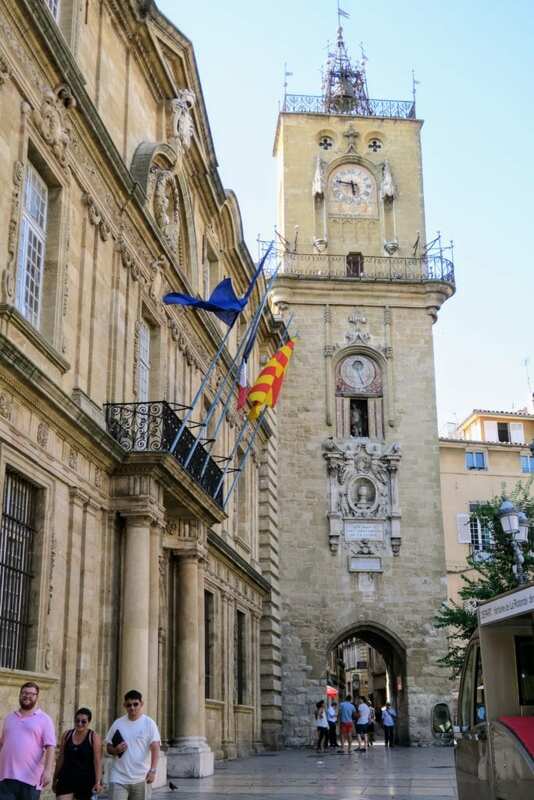 Many attractions of Aix-en-Provence can be reached on foot from Hôtel du Globe so you’ll be able the explore the town in an easy and pleasant way. Aquabella Hôtel & Spa is a beautiful 4-star hotel that comes with a stunning garden and a fantastic outdoor pool. The rooms are modern and have all the necessary equipment for a comfortable stay in Aix-en-Provence. Some of them come with a charming little balcony where you can have breakfast and enjoy a stunning panorama at the same time. One of the biggest advantages of Aquabella Hôtel is certainly the amazing large swimming pool which is especially useful in the hot summer days. You should also check out the hotel’s Spa that comes with a jacuzzi, a Finnish sauna, a hammam and offers a wide choice of treatments and massages. One of the best restaurants in Aix-en-Provence to try local cuisine is without a doubt 29 Miollis. Located on the picturesque Place Miollis this restaurant offers many delicious options such as salads, soups, meat and seafood as well. There are some tables available outside too which is especially nice during summer when you can have your meal while enjoying the view of the square at the same time. If you’re looking for a nice restaurant in Aix-en-Provence with great food, friendly staff and fantastic atmosphere then you should definitely check out the 29 Miollis. Piadina & Dolce is a perfect location for a quick and tasty meal in a casual and easy-going setting. The menu includes all sorts of piadinas which are a type of Italian flatbread, some salads and also a selection of delectable desserts. Depending on your preferences you can have a paidina with ham, cheese, vegetables or salmon but the list of options available is pretty long. For a dessert, you can go for a piadina with Nutella or opt for one of the iconic Italian desserts such as tiramisu or cannolo siciliano. If you need a quick pick me up snack while sightseeing around Aix-en-Provence Piadina & Dolce won’t disappoint. Anyone who’s looking for a fine dining restaurant with excellent service and attention to detail should check out Les Caves Henri IV by le Formal. This elegant restaurant offers a flavorful menu with savory options that are beautifully served and cared for in every detail. In fact, every plate seems to be a true art piece created by a talented chef with superb culinary techniques. Of course, there is also a fantastic wine selection with high-quality options which come from organic and biodynamic French vineyards. Paul Cezanne is my favorite artist and I can’t wait to visit his city of birth next summer. Aix-en-Provence has been on my travel bucket list for a while so I am really excited about this! Thanks for the photos and all the great info!